The Wall St. Journal is reporting this AM that, according to the proverbial “unnamed sources,” BAFTE (and sometimes Really Big Fires) acting director Kenneth Melson will be joining the history team sometime within the next week or so. Melson, who’s been taking his title of “acting” head a wee bit too seriously since April of ’09, will be thrown under the bus by the ObamaNation, in the hopes that his ritual sacrifice will calm the bloodlust in Congress and Stop All Those Difficult Questions They Keep Asking. As if. Power abhors a vacuum, as the saying goes. And you could easily make jokes about the giant sucking sound coming from the airheads at the top of the ATF pyramid scheme. The ATF has been without a permanent boss since the Bush days (2006, to be exact), the boss’s chair being held in limbo due to partisan Congressional squabbling over the appointment. And when your boss has a big “I’m Only Helping Out Until My Replacement Gets Here” sticker on his forehead, it’s hard to take the guy seriously. Which is, of course, part of the problem at the agency that should have a loose cannon as a part of their logotype. As they say in the effluent engineering biz, politics is a lot like a septic tank…the big chunks float to the top. And then there’s that smell… Obviously, the hearings on Capitol Hill are beginning to go from “annoying mosquito in the tent” to “swarm of blood-sucking horseflies” status at the other end of the mall in D.C. And with predictable certainty, the Obamanauts are looking for ballast to toss overboard as their ship of state begins to take on water over the gunwales. Back in November, Obama nominated Andrew Traver, the head of ATF’s Chicago office (hmm…Chicago. First place I’d turn to if I wanted to clean up corruption) to take over the troubled agency. Only the nomination was stalled in the halls of the Senate when the NRA pointed out that Travers is openly hostile to that whole 2nd Amendment thang. Never to bypass an opportunity to try to ram something down the throats of We the People, Traver is due in D.C. next week to meet with Attorney General Eric “I Know Nothink! Nothink!” Holder and Deputy AG James Cole. Word on the street is that the White House is considering if they can get away with replacing Melson with Traver as “acting head” or if they have to choose someone less controversial. Let’s see – the ATF is on fire, Justice is trying to put out that fire with a can of gasoline and a rather large match, and Congress is starting to ask some pointed questions with subpoenas attached. Yeah. Let’s ram some controversial choice held up in committee in there and see if it makes things better. That’s the moral equivalent of shaking a baby to get them to stop crying. With about the same success rate. Melson, if you will recall, has been directly implicated in the Project Gunwalker/Fast n’ Furious scandal, as he was a part of the Phoenix office that was Ground Zero for the “Guns for Gangstaz” program. The Phoenix office RAN Gunwalker in 2009-2010. This week, Congressman Darrell Issa (R., CA) disclosed internal docs showing that Melson was up to his elbows in the management of the Fast and Furious program. (Corruption? You’re soaking in it!) Melson even went so far as to requisition hidden cameras to be installed in a gun dealership that was cooperating with the investigation, to enable the ATF to watch the straw buyers purchase the weapons bound for Olde Me-hi-co way. Issa, along with Senator Charles Grassley, are leading the Congressional investigation into the cluelessness/overzealousness/corruption that is the entire ATF program and culture. And they are none to happy with the “cooperation” they’re getting from Melson and the ATF. Case in point, Issa held up a page from an internal ATF document that had been…um…redacted a little. It was a white piece of paper with the entire text blacked out. Yep. White paper. Black square. Looked like some kind of card you’d expect to find in a test for mental telepathy. (We’re not gonna tell you what you wanna know. You have to guess.) 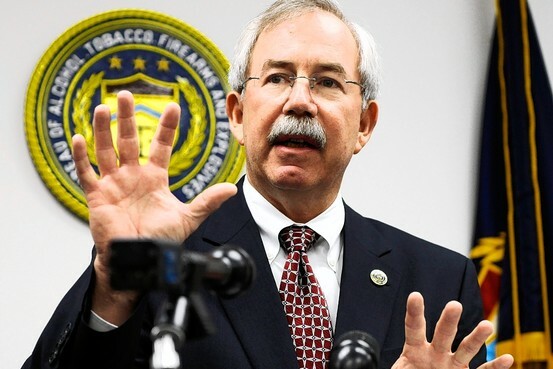 Assistant AG Ronald Weich stated on the record that the ATF and Justice were cooperating and actively working to respond to the committee’s requests. Outraged, Issa held up the redacted page and said, “You should be ashamed of yourself. The pages go on like this forever. You’ve given us black paper instead of white paper. You might as well have given us a ream still in its original binder. How dare you make an opening statement of cooperation.” You tell ’em, Darrell. Here’s a thought: maybe you might be able to deflect some criticism (although not as much as you’d like) and simultaneously solve the ‘culture problem’ at the ATF if you would nominate someone who is from outside the agency. I dunno…I’m thinking someone who has a background in law enforcement and management. Perhaps someone from a large city that has some respect for the 2nd Amendment. Somebody that would be able to rein in that bunch of over-reaching, ‘the rules don’t apply to us’ guys who are more interested in politics and amassing power, than enforcing the law in any meaningful way. The amusing thing, (if you can find incompetence, corruption, and overreach that lead to the deaths of two U.S. law enforcement officers as well as untold, countless deaths of Mexican citizens) is that the Obama administration thinks that sacrificing Melson on the altar of the Oversight Committee is gonna stop this train and let the ATF’s jackbooted thugs get back to Harassment as Usual. Nope. The more they dodge and weave, shuck ‘n jive, dissemble and deflect and generally piss off Congress, the worse this is gonna get. And when Congress (and eventually…hopefully, the lamestream media) smells blood in the water, Melson’s scalp will not quell their bloodlust. Nope. I’m thinking Holder might want to start getting used to the “bald is beautiful” look. Napolitano and even Obama himself might want to check the thermostat, too. It’s likely to start getting a little toasty in there. Assuming the scandal does reach as high as the White House, I wonder how long it will take to resolve and how profoundly it might affect the Obama 2012 campaign. Hell, if Jimmy Carter can have a post-White House career on the rubber chicken circuit, why not Obama? I would certainly agree that one term is enough, but I don’t see “The One” being thrown under any bus. Weiner was just some little guy, but by casting Obama as a kind of messiah the Dems will have a tough time writing him out of the script. I would like to wee them try, though. I think the ATF scandal could be used to great advantage by an opponent of Obama’s in the 2012 race if it get’s close enough to Obama and if, IF, such an opponent had the courage to use it. Isn’t that what we saw with Trump and Obama’s birth certificate? Ha! I still can’t get over a clown named Weiner showing off his weiner! Weiner went limp after he failed to rise above scandal. His wife wondered where Weiner’s head was at. Weiner wanted to stretch out his term, but he fell short. Weiner had to short stroke his career. The cold winds of change made Weiner shrink. That’s how I know there is a God… and he has a sense of humor. It all depends on whether Melson accepts the scapegoat role. He is a career LEO. I bet he starts talking. Why should he take the fall for an agenda driven scandal?